In a true sense, one tunes the vibratory feeder base drive, and not the vibratory feeder (bowl) itself. Vibratory feeders come in all shapes and sizes but they all must be tuned correctly with their drive unit. Luckily, virtually all vibratory base drives are equipped with interchangeable flat springs, and suppliers offer various thicknesses to fit your needs. For new feeder bowls, builders must add, subtract, and/or move springs to achieve proper tuning before the feeder ever gets to its final destination. Vibratory Feeders that have been in use for upwards of 2-5 years undergo an aging process call work-hardening. As the feeder vibrates, the steel in the springs change on a molecular level, causing the bonds between atoms to become stronger, thus making the steel springs harder. 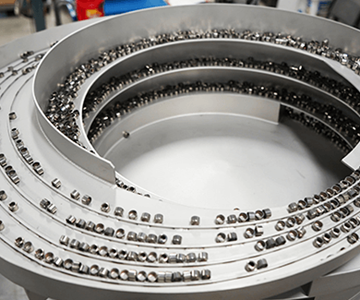 As the springs harden, the vibratory feeder performs progressively worse, ultimately causing problems within the production line. By performing the checks and tests in this module, operators can quickly elevate the performance of an aged vibratory feeder. Always wondered how to tune your vibratory feeder? Look no further! Here is a detailed whitepaper with step by step instructions, provided to you by Hoosier Feeder Company. The feeder is tuned, but still not working correctly. Now what? The reality is it could one of the issues mentioned above, a combination, or a completely different problem. When unsure of how to fix a vibratory feeder bowl, it is always suggested to consult with the manufacturer or industry experts to identify the issue. In most cases, a spare part or two and an experienced eye can fix a broken feeder. If you’re having issues and need help, contact the experts at Hoosier Feeder Company! Is there a way to tune a feeder without manually checking? 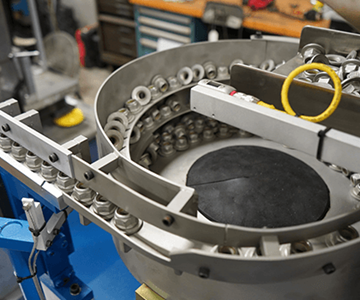 Fortunately, vibratory feeder controls manufacturers have come a long way in the last decade and there are Variable Frequency (VF) controllers that use accelerometers to find the resonant frequency of a feeder bowl. From there, you just add or subtract springs to bring the frequency to the desired value. You can get the latest VF controllers at our sponsor’s website here.